Flower arrangement in Japan is called Ikebana, a tradition to arrange and observe seasonal flowers. 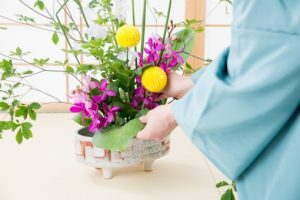 Kado is a type of Ikebana – it is an art to combine flowers and trees which is said to be established during the mid Muromachi period by some of the monks in Kyoto. For those who might be interested, there is a TV drama focusing on Kado called “高嶺の花 / Takane no Hana” now on channel 4 (Nihon TV) every Wednesday from 10pm. You will be able to enjoy the gorgeous flower arrangements in Japanese styles, and also the heroine would be in beautiful kimonos. Please share with us your favorite Japanese TV shows / dramas! Let us know if you need any help understanding the story line. Not a member yet? Be a member of QuickHelpJapan and enjoy like a local! Copyright © 2017 QuickHelpJapan Inc.